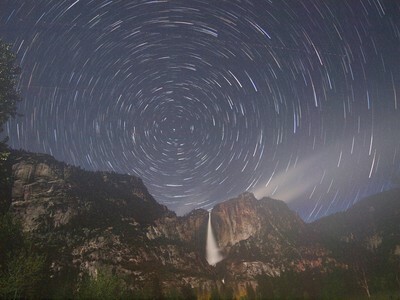 Star trails are great. Star trails with the landscape illuminated by a first quarter or brighter moon is better. Including a heavily flowing Yosemite Falls in the frame is best……Normally I would have framed this image to put Polaris (the North Star) closer to an upper corner, both to break symmetry and to get more landscape. However, my two big tripods were supporting my 35-mm cameras (doing star trails the old fashioned way) and I had to put the E-5 on a little 12-inch-high hiking tripod and that made aiming a bit difficult……BTW, the trails thin out due to dew building up on the lens. The bright streak to the right of Yosemite Falls is a patch of advancing clouds.